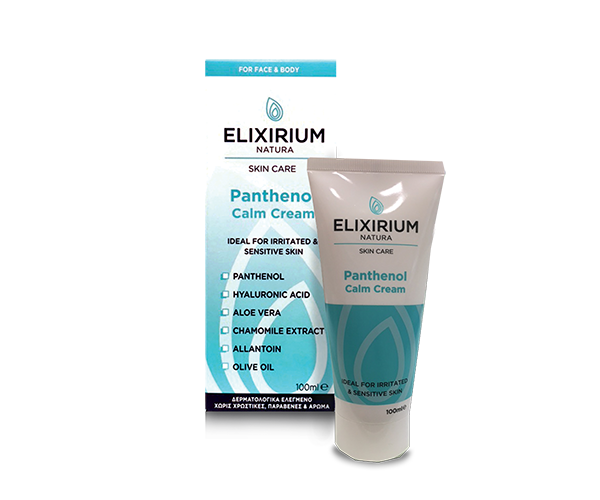 ELIXIRIUM NATURA - PANTHENOL CALM CREAM. 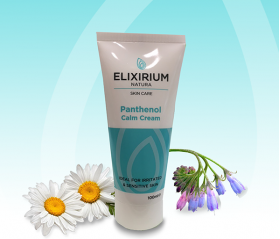 HomeElixirium NaturaSKINELIXIRIUM NATURA - PANTHENOL CALM CREAM. Cream ideal for face and body. It contains panthenol, aloe juice, chamomile extract which sooth and calm the skin, while hyaluronic acid hydrates and enhances its elasticity. It is ideal for children. It does not contain colour and fragrance, and is absorbed quickly, leaving no trace of greasiness. Recommended for use after exposure to severe weather conditions such as sun or cold and in cases of dry skin or irritation from using soaps. It is also recommended for skin care after peeling (eg laser treatments), tattoos or as a base cream for mixing with other preparations (eg. cortisone-antibiotic). *Be carefull, do not use on open woonds. Use: Apply a generous layer of cream as often as necessary on the face and body. Ideal for children. 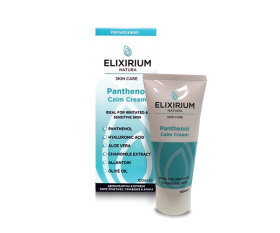 Συστατικά/Ingredients: Αqua, Glycine Soja Oil, Cetyl Alcohol, Glyceryl Stearate, Glycerin, Panthenol, Myristyl Myristate, Glyceryl Stearate Citrate, Cetearyl Isononanoate, Butyrospermum Parkii Butter, Olea Europaea Fruit Oil, Phenoxyethanol, Cera Alba, Ethylhexylglycerin, Sodium Stearoyl Glutamate, Xanthan Gum, Sodium Gluconate, Sodium Hyaluronate, Chamomilla Recutita Flower Extract, Aloe Barbadensis Leaf Juice, Citric Acid, Potassium Sorbate, Sodium Benzoate.